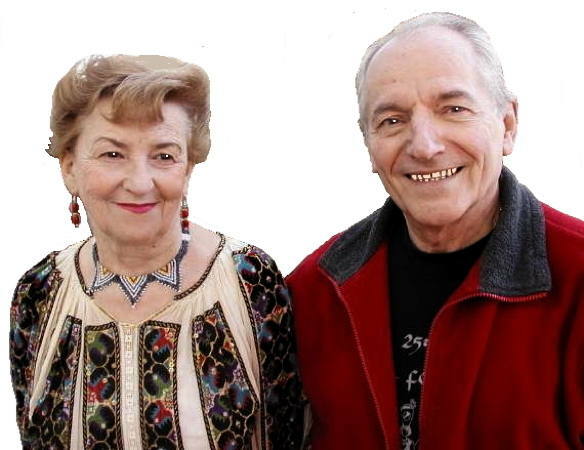 Information: Theodor and Lia Vasilescu, researchers, teachers, and authors of books about Romanian dance. Theodor Vasilescu was born to a well-to-do, landed family near Cluj in Transylvania. He had no contact with village life or with peasants as a child, took lessons on the accordion, piano, and violin as a child. At the age of fifteen or sixteen, he began playing tango, foxtrot, and swing music at dance balls. (Americans were in Romania from 1944 to 1947, and American movies with stars such as Frank Sinatra and Dorothy Lamour were very popular. Theodor learned the film's soundtrack music.) He also played music for a folklore group, realizing that folkloric music could bring his orchestra more contacts. At that time, his father lost his position in the army and the family had begun selling the family's possessions to make ends meet. The instructor for the amateur folkloric group "Cununa Carpatilor" Folklore Ensemble for which he played was the famous instructor and folklore collector, Gheorge Popescu-Judetz, from whom Theodor learned to dance and teach, when Gheorge noticed that Theodor was correcting the dancers' steps and styling. Theodor joined the group in 1947 and within two years, he had become more knowledgeable about folklore than any of the other members. One of those members was his future wife, Lia. Theodor finished secondary school in 1951 and went to a polytechnical college where he studied chemistry. The family moved from Cluj to Bucharest in 1944. He was accepted as part of the youth dance team at the university whose rule was "No dance without documentation," requiring him to go into villages to do research, learn dances, and write everything down (no video in those days!). The group danced for television shows and for ballroom sessions. He studied ballroom dance and formed a group of four couples that taught and performed for quarter-hour television shows. This exposure led to his being asked to create choreographies in Romania. Theodor graduated with an M.S. degree as a chemical engineer, working in the morning and dancing in the afternoon. In 1964, having taken over the position and responsibilities held by a retired ballet mistress, Theodor decided to follow folklore research as a full-time profession. That same year, he choreographed dances for a group in The Netherlands and has returned each year. Since then, he has choreographed for professional dance ensembles such as AMAN International Music and Dance Company (Los Angeles), Budlet (Hong Kong), International Danstheater (Amsterdam), and L'ensemble National de Folklore "Les Sorti" (Montréal). He also has choreographed for several large open-air performances. Of course, he has done numerous choreographies for professional and amateur ensembles in Romania. From 1976 to 1985, Theodor was the Chief Choreographer of Romanian National Professional Ensemble Rapsodia Romana. He was head of Choreographie at the National Center for the Preservationa and Promotion of Folklore, was head choreographer for Cununa Carpatilor Folklore Ensemble in Bucharest, and was a teacher of Romanian folk and character dance at the Theater and Film Academy of Bucharest. Under the socialist regime it was not easy for Theodor to leave Romania. His first visit to Japan in March of 1986 was possible because it was organized by the Japanese Folkdance Federation, which had official connections in Bucharest. That same year he was invited to teach at Bora Özkök's camp but was not allowed to leave Romania because of "official national duties." Since 1990, travel has become easier and Theodor has taught in Germany, Hong Kong, and the United States. Theodor is now an independent choreographer and dance instructor, as well as the leader of the Folklore Dance Academy and the president of the National Association of Folklore Choreographers of Romania. Wanting his paper qualifications (specialized studies or certificate) in folklore, he enrolled in the Academy of Music, later receiving grants to study in Russia and China. He began writing, editing, and publishing books on dance and methods of teaching folkloric dance, publishing more than 56 volumes. He developed and perfected a dance notation system specifically for folkloric studies that was less complicated than that of Laban. This notation system is currently used by professional and amateur chroeographers throughout Romania and other countries. He also authored Folclor Coregrafic Romanesc (Romanian Folklore Dances), based on several years of research throughout Romania, that includes a collection of 130 dances from all parts of the country. Lia Vasilescu was born in Sibiu, an old town and important cultural center in the Transylvania region. She was attracted by music and dance, and sutdied classical music and ballet at the local Art Schgool. After graduating from high school, she attended the University in Bucharest, graduating as an English teacher. While in Bucharest, she became interested in folk dance and joined the amateur group Cununa Carpatilor Folklore Ensemble, where she met Theodor Vasilescu, then the group's choreographer and dance teacher. The group toured Belgium, China, France, Germany, Italy, The Netherlands, Russia, Viet Nam, and several other European countries. Lia was a member of the group for 24 years. Lia and Theodor were married in 1959 and have a son, Florin, who is an engineer and amateur folk dancer, and two grand children. Since they met, the couple has worked together in the in the field of research, enriching their knowledge about the traditional life and the creation of Romanian villages. Theodor and his charming wife, Lia, have participated in many workshops, which have endeared them to many dance communities. Beginning in 1990, Lia started teaching workshops and week-end camps together with Theodor in California, Main, New Mexico, New York, Texas, and Washington. They have given workshops and master lessons throughout Canada, Finland, Hong Kong, Germany, Japan, The Netherlands, Norway, Sweden, Switzerland, Taiwan, and the United States, presenting with a style that is swiftly paced, yet attentive to details. 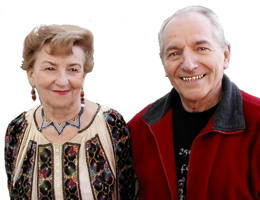 Several dance teachers, such as Sunni Bloland and Niko Hilferink, have popularized many of Theodor's dances. Lia passed away on October 20, 2018. Caveat: "The positive point to most of his creations is that normally the music, style, and steps are recognizable when you go to the area. But the structure (choreography) is fabricated and it is this structure that I see folk dancers discussing and preserving in detail!" Graphical Dance Notation System, 1969. Theodor Vasilescu. Romanian Folk Dances 1. Lia and Theodor Vasilescu. Romanian Folk Dances 2. Lia and Theodor Vasilescu. Romanian Folk Dances 3. Lia and Theodor Vasilescu. Romanian Folk Dances 4. Lia and Theodor Vasilescu. Romanian Folk Dances 5. Lia and Theodor Vasilescu. Romanian Folk Dances 6. Lia and Theodor Vasilescu. Romanian Folk Dances 7. Lia and Theodor Vasilescu. Romanian Folk Dances 8. Lia and Theodor Vasilescu. Romanian Folk Dances 9. Lia and Theodor Vasilescu. Romanian Folk Dances 10. Lia and Theodor Vasilescu. Romanian Folk Dances 11. Lia and Theodor Vasilescu.